This is actually my own invention, since gatherings of people where each person is expected to bring a dish of food to be shared among the group don't seem to be as common in Latin America and as far as I know there is not a set term for them. I'd love other suggestions. 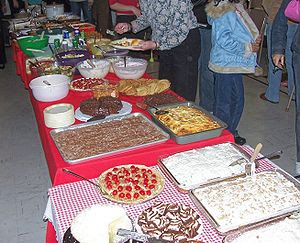 Folk etymology has derived the term "potluck" from the Native American custom of potlatch; the word "potluck", however, is actually of English origin. It is a portmanteau word formed from (cooking) pot and lucke. The earliest written citation is from 1592: "That that pure sanguine complexion of yours may never be famisht with pot lucke," Thomas Nashe. As this shows, the original meaning was "food given away to guests", probably derived from "whatever food one is lucky enough to find in the pot", i.e. whatever food happens to be available, especially when offered to a guest. By extension, a more general meaning is "whatever is available in a particular circumstance or at a particular time." The most common usage was within inns, taverns, and staging posts in the United Kingdom from the 16th century onwards. A wealthy traveller might ask what the hosteller had to offer to eat, and be told 'chicken', or 'beef' etc., and choose it. The poorer traveller might have to do with 'pot luck', a stew of whatever was left over from the fare of the last few days or weeks. Having usually been boiled many times over, it was safe enough, and often tasty, though its nutritional value was often low. Accompanied by starchy foods like bread or potatoes, however, the traveller might go to bed well satisfied. This form of eating lasted into the 20th century. “Convivio” here (reporting from Mexico City). No idea how generalized this is. Mmhhh... when it doesn't have a community aspect to it (i.e., a party where people bring food to share) we call it "fiesta de traje" (traje esto, traje aquello). I agree with Mago on convivio when it does have a community intention. in Nicaragua we also use "fiesta de traje" but it is very informal, more common among friends. "convivio" does have a more community feeling but (at least here) it does not necesarily imply you should bring food. in south america "olla comun" is used when people gather to collect the ingredients to cook a large pot (or many dishes). it is not excatly the same idea, but it does have a community aspect. Oh yes, "ollas comunes" are super common in Colombia. But, like goya said, the idea is that everybody cooks (and does the dishes!). "Vaca" is a related concept: when everybody chips in. The other very common practice is to share what you cook with neighbors or people that couldn't come to the party. In the Colombian Caribbean we call that "sarapa" (probably because the word means something that is wrapped). Potluck in Spanish is "viandas". It actually refers to a varierty of meals in separate containers, usually prepared by different people who bring them over to a casual gathering to be shared by the group. Just like in English "fiesta de viandas" also means a rather informal potluck party.